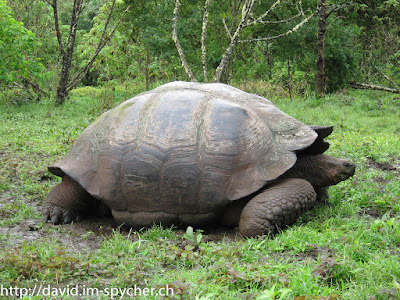 It didn't take long after arriving in Galapagos that I realized that I stepped into another world. We went to the pier of San Cristobal to catch a tender (a small boat), which would bring us to our Yacht, and we spotted Galapagos Sea Lions lying around everywhere! Even just next to the platform where the tenders alighted, was a Sea Lion mother with her baby and she wasn't disturbed by our presence at all. Over the next 14 days we made 35 dives in several different places, so I'll limit myself to the absolute highlights. The best safety stop ever: We were swimming away from the reef to do our safety stop when a Galapagos Sea Lion said hello. Next we spotted a group of Bottlenose dolphins which was swimming close-by. I then turned around to see if the Sea Lion was still around and I spotted a Whale Shark crossing my way! 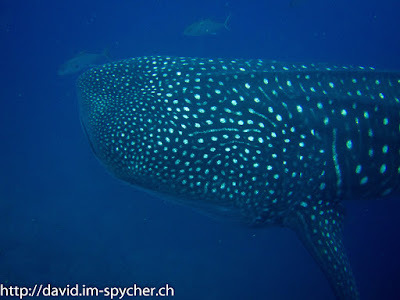 Whale Shark city: Darwin, the northernmost of the Galapagos Islands, turned out to be Whale Shark city. Over the course of eight dives I counted 24 Whale Shark sightings. At times we even saw two at once. During one dive there was so much Whale Shark activity, that every time you lost one from view, you just had to turn around to spot another one! Punta Vicente Roca: Even though these were the coldest dives of the whole trip (15 - 19° Celsius water temperature), the three dives were absolutely amazing. First off there was an amazing wall with beautiful Sea Fans, but the wildlife topped it all. 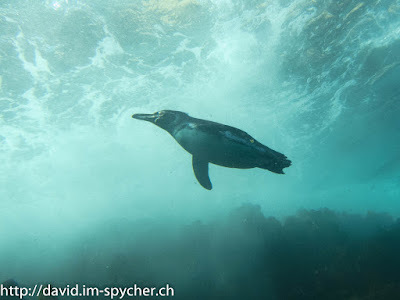 We saw Mola Molas (Ocean Sunfish, which can only be spotted in a handful of places worldwide), Galapagos Penguins and Marine Iguanas feeding underwater and we even saw two birds hunting underwater, the Blue-Footed Booby and the Flightless Cormorant! 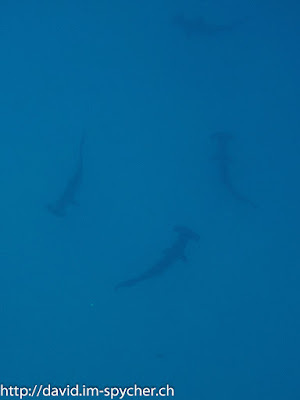 Scalloped Hammerheads: In Wolf and Darwin we regularly spotted larger numbers of Scalloped Hammerheads, however, due to the mediocre visibility and the shyness of the animals it was very hard to see them clearly. Every time we got closer to a group they just went further out. Nevertheless it was very cool to see them so often. Unfortunately, the visibility was not so good at the start of the trip (up to 15 meters) and got gradually worse. Once or twice it felt like diving in a Swiss Lake: Green Water and 3 meters visibility! The highest temperatures were in the North with 25° Celsius, but most of the times it was around 19°. Add to this the sometimes strong and crazy currents (wave-like or in circle or up and down) and it is easy to see why this is a place for advanced diving. But it was worth it! 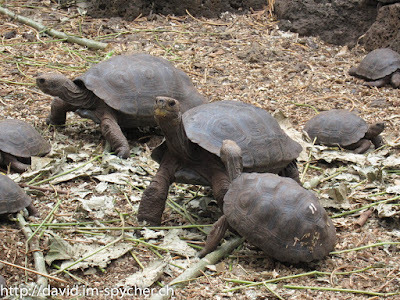 On the last day we made a land tour to visit the Galapagos tortoises in their natural habitat as well as the rearing station where they raise the babies for up to five years before setting them into the wild. Seeing the size of the adults and then comparing them to the tiny babies is an eye opening experience.